Small notice: from now on, our firmware news roundup is going to be published on Friday instead of Monday. Because of that, we’ll likely cover the updates from both the last week and this one on this Friday. Thank you for your understanding. 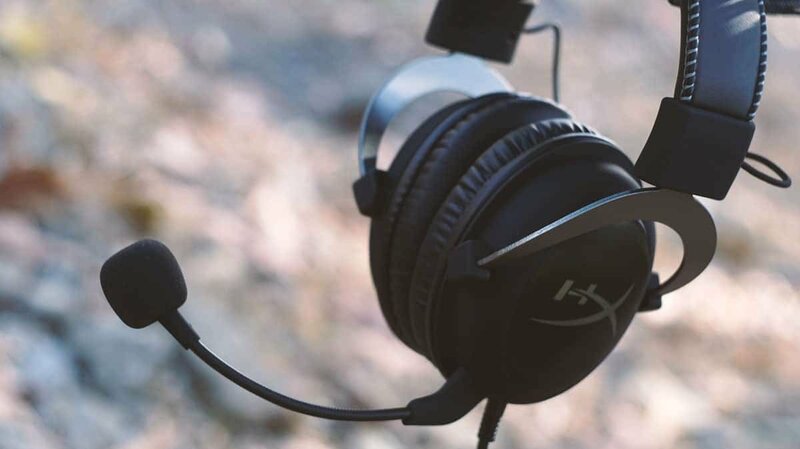 The Kingston HyperX Cloud 2 is one of the most popular gaming headsets to ever come out. Thousands of both pros and consumers are using it and are saying that it’s the best headset they’ve ever owned. 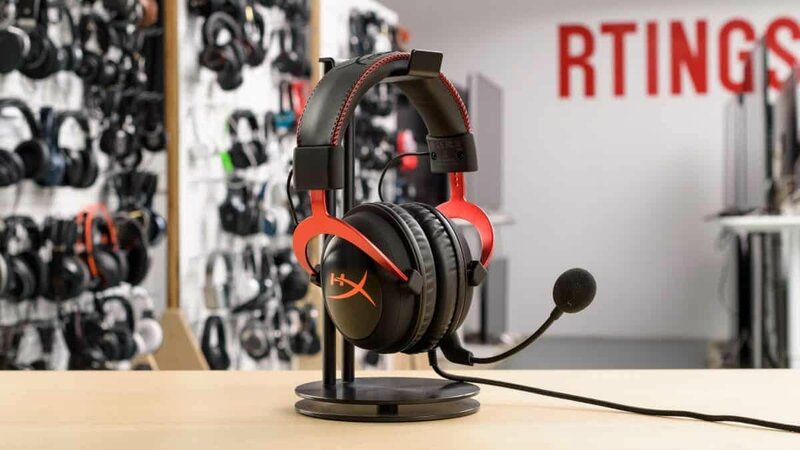 One of the big advantages that it has over your average gaming headset is that it can be used not only on PC, but also on other platforms like PS4 or even Android. But, is it any good on smartphones and tablets? Well, let’s find out! So, for those of you who don’t have the Kingston XyperX Cloud 2s, let’s take a look at build quality first. Speaking from experience, we’ve got to say that this is definitely one of the most durable headsets that we’ve ever seen. It’s mostly made of metal but it’s also flexible enough so that you won’t be afraid of breaking it or anything. Furthermore, it’s also reasonably lightweight – which is somewhat amazing for a headset that’s mostly made of metal. It weighs about 320 grams which is a tiny bit heavier compared to the Mixcder E9s that we recently reviewed. That’s obviously a lot heavier than your average earphones. But, let us not forget that earphones are often nowhere near as powerful as over-ear headphones like the Kingston HyperX Cloud 2s. The design is fairly minimalistic here. Nothing too fancy. You get a detachable microphone, controllable height level, and that’s about it. A removable cable would most certainly be a nice addition for the sake of portability. But, oh well. 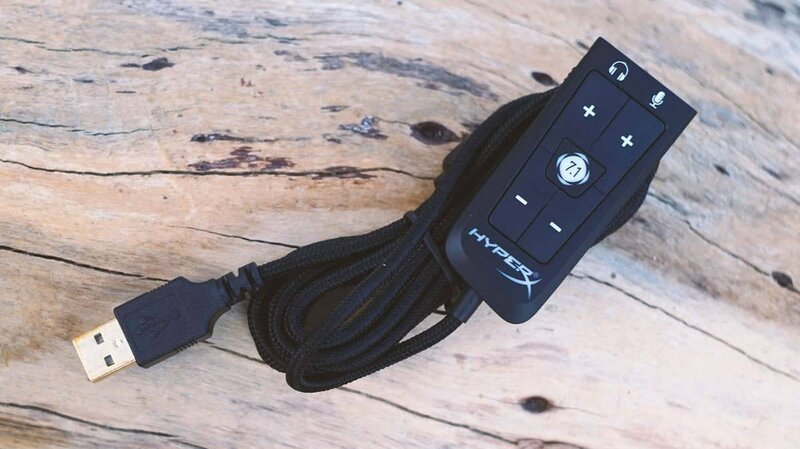 If you’re using the Kingston HyperX Cloud 2 on PC, then you’ve got the option of controlling the headset with this USB dongle. But, on an Android smartphone? Can’t see that happening. You may want to try connecting it with an OTG adapter, but chances are that it will refuse to work. And even if it does, carrying that thing around with your phone isn’t going to be one of the most pleasant experiences. So, if you’re planning on using this headset on your Android device, chances are that you’ll have to raise the volume manually from your phone. 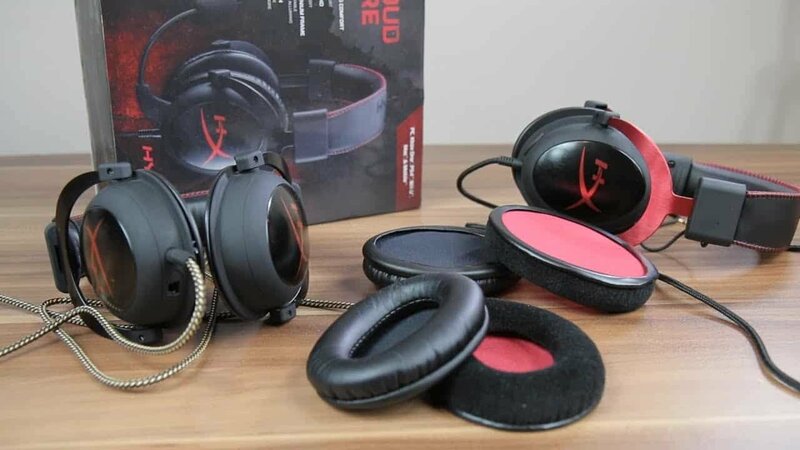 Furthermore, another common feature that you can find at this price range but is lacking on the Kingston HyperX Cloud 2, is active noise canceling. Obviously, this headset is not really made to be used while traveling or anything. That’s why there was originally no need to add noise cancelation. But, we’re reviewing it based on how it performs solely for Android devices. So, do keep that in mind. One thing that it offers, though, is two sets of ear pads and noise isolation. Here is where we noticed something interesting: the two sets of ear pads affect not only comfiness but also sound quality and the level of noise isolation. One would commonly think that the velour ear pads are generally going to feel more comfortable. But, it’s a tiny bit more complicated than that. Both ear pads have their pros and cons. The velour ear pads feel extremely comfortable and soft for the first 30 minutes or so. Softer than a pillow even. However, the head fatigue gets worse and worse the longer that you wear them. Leatherette ear pads, on the other hand, immediately give you a slightly less comfortable feeling when you first put them on. But, even after hours of use, they somehow don’t cause any fatigue at all. Overall, the Kingston HyperX Cloud 2 is definitely one of the most comfortable headsets that we’ve ever tried. After all, that’s one of the big advantages of gaming headphones/headsets compared to traditional ones. However, gaming headsets also tend to be bad on the audio quality department. So, how about our choice here? With the dynamic 53mm; neodymium magnets and a frequency response of 15Hz – 25,000Hz, you can definitely expect a heavy punch from the Kingston HyperX Cloud 2. One would naturally think that a headset with an impedance of 60 ohms would be rather quiet on a low-power Android smartphone. But, surprisingly enough, that doesn’t seem to be the case. We tested this headset on the Xiaomi Redmi Note 5 Global while using PowerAmp and the truth is that we could hardly turn the volume past 50%. That’s just how loud they get. But, do keep in mind that results may differ from phone to phone. As for audio quality, we got different results depending on which set of ear pads we were using. First of all, the sound was pretty crappy without using an equalizer. Sharp treble, dead base, no mids, etc. However, that has been the case for most of the headphones that we’ve tried anyway. Engaging the equalizer with PowerAmp made a world of difference. Let’s start our test with the velour ear pads. While listening to music with the velour set installed, everything felt balanced. Bass was strong but not strong enough to overwhelm the other sounds with mids and treble being decent. The treble gets a bit too sharp when you turn up the volume but that’s something that you can partially manage with an equalizer. Noise isolation was somewhat good. But, far from perfect. People next to us couldn’t hear a thing. However, we could somewhat hear the rumbling of the bus until the volume was turned up a bit. Moving on to Leatherette, which is the pre-installed set, we immediately noticed that the noise isolation is much better. Actually a bit too good for moving out and about because, despite the lack of noise cancelation, it’s hard to hear anything. Furthermore, the bass response immediately becomes stronger. If you turn it up on PowerAmp it’s almost unbearable and it drowns the other frequencies. This is the first time that we turn down the bass levels on a headset. Other than that, the headset also feels much louder. Not sure if that happens because you can no longer listen to outside sounds or because there is a tighter fit. But, the Kingston XyperX Cloud 2 definitely feels louder with the leatherette ear pads on. When it comes to microphones, well, let’s just say that we’ve seen better options. Even the microphone from our smartphone sounded better than that. Don’t get us wrong. The mic sounds crazy good on a PC. The warm, high quality sound that it offers is more than enough for a pleasant gaming experience. But, for some reason, that doesn’t seem to happen with smartphones. At least it didn’t happen with ours. It sounded a bit like AM radio if that makes sense. Portability isn’t much better either. The Kingston HyperX Cloud 2 is neither wireless or foldable and it also doesn’t have a removable cable. It does have its own portable case which makes things easier. But, you’ll still need to have a hand available for holding it at all times. Folding it around your neck is not an option either. If you’re skinny enough, you’ll manage to do it but it still won’t fit around comfortably. As for sports? It’s not that bad actually. You can go for a little run without it falling off but don’t expect anything else. Wouldn’t go for Tennis with it. That’s the price that you pay for comfiness usually. Phone doesn’t recognize the headset: either plug in the microphone and then plug in the headset or use an app like Sound About to force headphone output. Headset stops working immediately and stars on its own with bad audio quality: just reboot your phone and it will be fine after that. If you need primarily a gaming headset and you can’t afford another expensive headset for your smartphone, then the Kingston HyperX Cloud 2 is still a very good option. 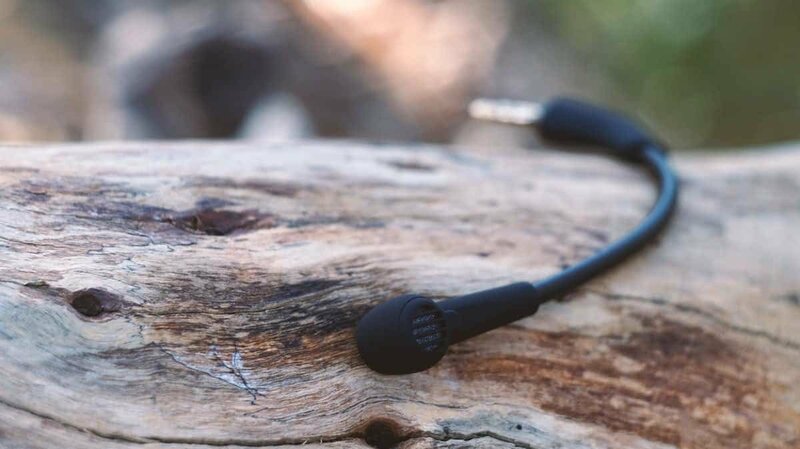 However, if you’re primarily looking for a headset that plays well with your Android phone, then chances are that you’ll probably prefer something like the Mixcder E9 as it’s mostly made with that in mind. Headphones And Headsets: What’s The Difference?